Jan's journey to become a therapist has been unusual. 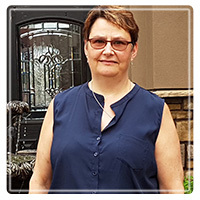 After graduating in 1981 from Foothills Hospital School of Nursing, in Calgary, Jan began a career that spanned over 30 years of critical care nursing. Working in areas such as adult critical care, Emergency, as a flight nurse with Saskatchewan Air Ambulance and in Obstetrics, she saw the effects of stress, emotional and physical illness, grief, and trauma. Jan saw it as a privilege to walk with those as they began, were in the midst of, and at the end of life. The longer Jan worked, the more she saw the effects on the staff that she worked with as they worked in front lines, and began to take courses in Critical Incident Stress Management. She then completed a Master of Arts in Counselling from Providence Theological Seminary in 2014. After a full career in nursing, Jan transitioned into counselling by spending the 2014-2015 school year doing a counsellor-education teaching fellowship at Providence working with student counsellors completing their practicums. As trauma work is important to Jan, because of the effects on people, Jan has taken further training in EMDR - Eye Movement Desensitization and Reprocessing), and is currently working toward certification. Jan combines an integrated approach to therapy, utilizing A variety of therapies that are tailored to the client's needs. Included are EFT (emotionally focused therapy) for couples; cognitive-behavioural therapy, solution focused therapy, attachment, and neurobiology. Jan's belief is that healing comes from a willingness to deeply experience, explore and feel one's emotions that are related to present and past circumstances. The power of unprocessed experiences from the past, can impact one's present day life. These unprocessed feelings and emotions can often come out in anxiety and depression, as well as a host of physical symptoms. Processing the negative thought patterns can free a person from the distress of their past and help them to gain insight into behaviour, thoughts and feelings. In turn, this will assist the person to create space for new, more positive experiences and behaviour. The impact of this is important for both the person and the relationships that they are a part of. Therapy is not easy, but a process that requires work, commitment to the process and faith in the journey. Often it is a slow, steady growth that will lead to changes in our brain pathways and chemistry, and a more permanent change in feelings and behaviour. Jan counts it a privilege to walk with people through this journey, and is determined to work together with those who come to her, toward a better quality of life. Jan is a Registered Psychotherapist (RP), with the College of Registered Psychotherapist of Ontario (CRPO); a Certified Professional Counsellor (CPC) with the Professional Association of Christian Counsellors and Psychotherapists (PACCP); and a retired member of the Saskatchewan Association of Registered Nurses (SRNA).